Dry. Prairies, hillsides. Sandy or gravelly soil. This is a 12″ to 32″ tall, erect, perennial forb that rises from creeping roots. 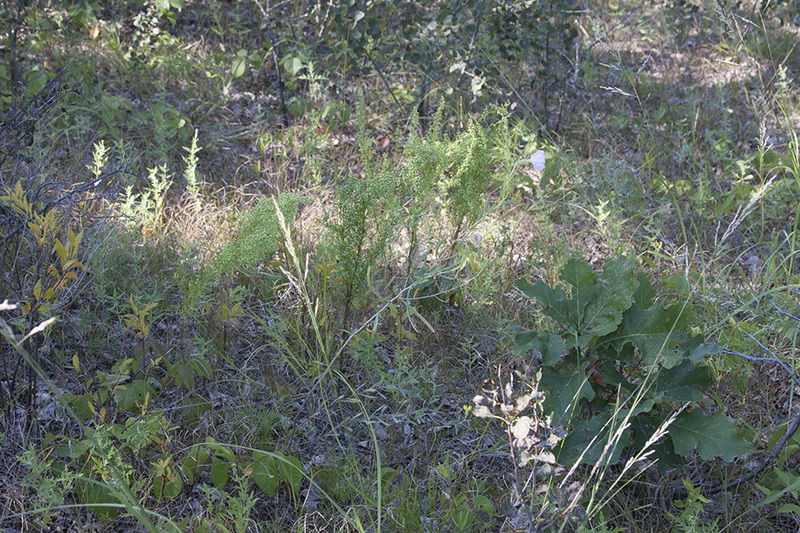 In the first year it forms a 3″ to 6″ wide rosette of basal leaves. In the second year it send up a flowering stem. It usually dies after bearing fruit once. 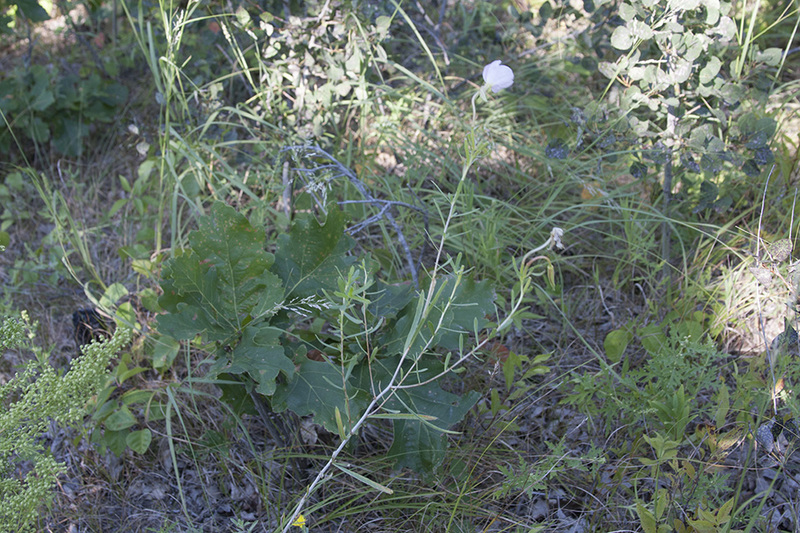 The stem is silvery-white, erect, and branched. 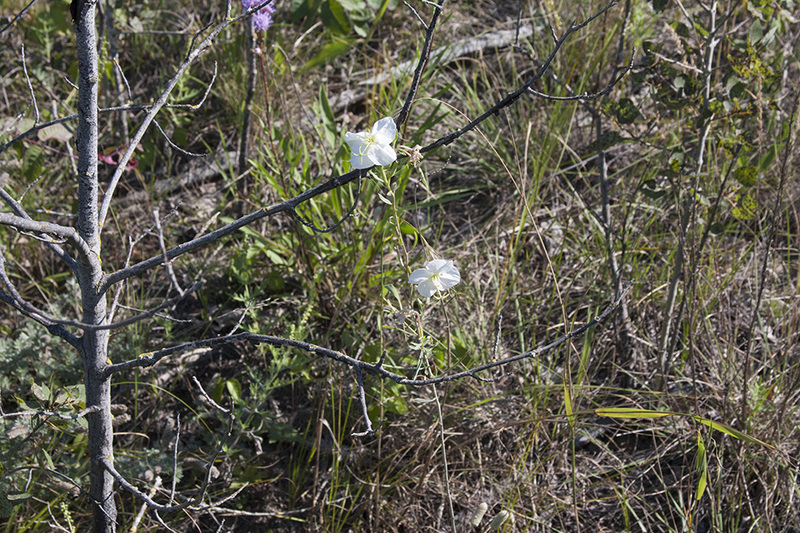 Near the base it is hairless and may be covered with white, peeling bark. Near the inflorescence it is covered with minute, glandular hairs. The leaves are alternate, stalkless, ascending to widely spreading, linear to linear-oblong, ¾″ to 3⅛″ long, and about ¼″ wide. They taper to the stem at the base and taper to a point at the tip with straight sides along the tip. The upper surface is hairless. The lower surface is covered with short, white, curved hairs. The margins are mostly untoothed, though sometimes there are barely perceptible teeth near the tip. The inflorescence is flowers appearing singly in the upper leaf axils. The flowers are large, showy, and stalkless. What appears to be a flower stalk is actually a structure formed by the fused bases of the sepals, petals, and stamens (hypanthium). The hypanthium is yellowish-green to reddish and covered with minute, fine, short, soft hairs. When in bud it is ½″ to 1″ long or longer and drooping, with the bud nodding downward. When in bloom the hypanthium elongates to 1″ to 1½″ in length, straightens somewhat, and the flower is held pointing outward or somewhat upward. 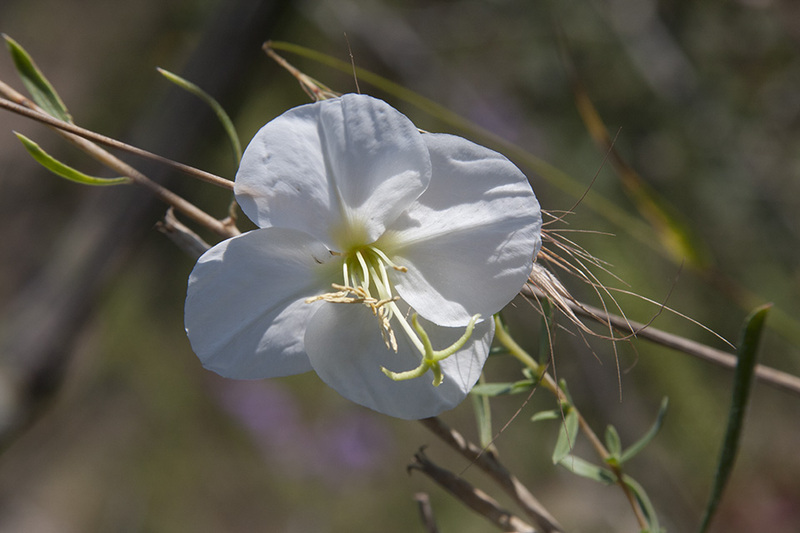 The flowers are ½″ to 2″ in diameter when fully open. 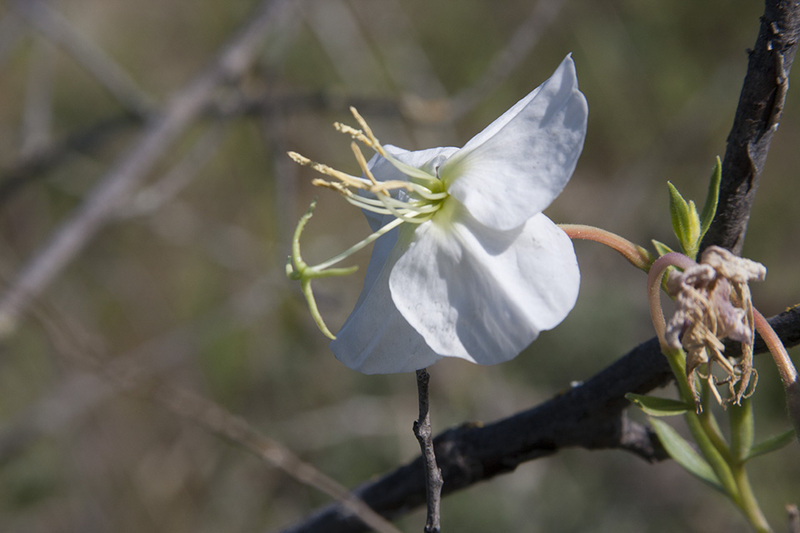 There are 4 sepals and 4 petals. 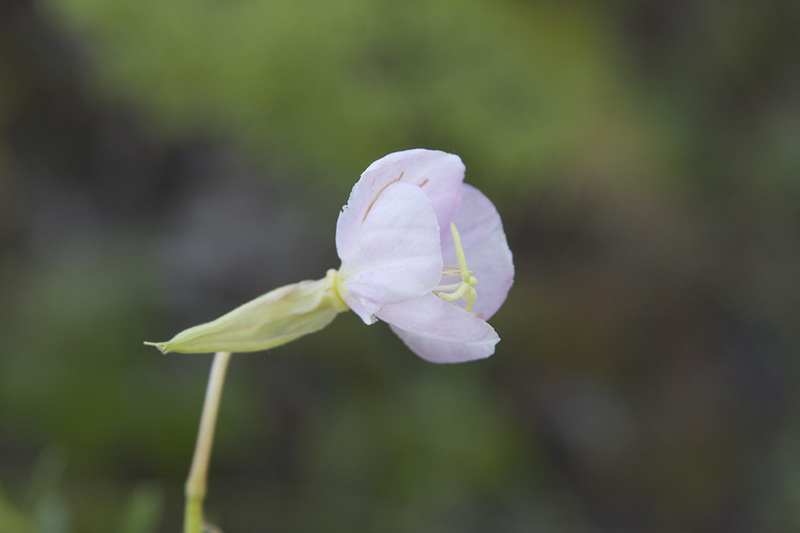 The sepals are green, linear, and strongly bent backward along the flower stalk. The petals are white, turning pink with age; broadly elliptic or egg-shaped, and ½″ to 1″ long. 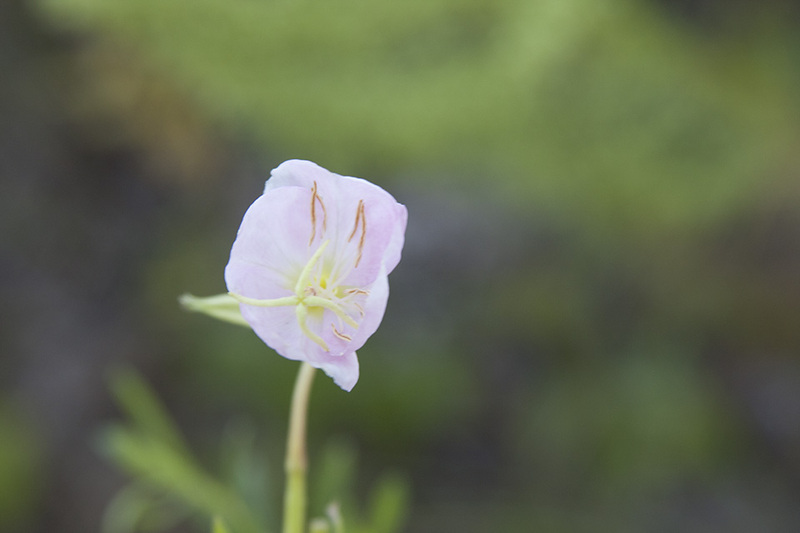 There are 8 stamens of equal length, 4 united styles, and a distinctive, 4-lobed, cross-shaped stigma. The flowers have a disagreeable odor. They open around sunset and on cloudy days, and close by noon. They change from closed to fully open in just one minute. They are pollinated by hawk moths or sphinx moths, which feed on their nectar at night. The hypanthium, petals, and sepals are deciduous, withering and falling off when the fruit is formed. The fruit is a cylinder-shaped, ⅜″ to 13 ⁄16″ long, 4-celled capsule. The capsule is round or nearly round in cross section, and has 4 shallow, longitudinal grooves. It is densely covered with minute, white, appressed hairs. Each cell of the capsule contains one row of dark brown, egg-shaped seeds. A cup-like tubular structure of a flower formed from the fused bases of sepals, petals, and stamens, that surrounds the pistil. Its presence is diagnostic of many families, including Rose, Gooseberry, and Pea. Long and narrow with parallel sides, as in a blade of grass. The portion of the female part of the flower that is receptive to pollen.